Matthew T. Cox joined Buffington Law Firm as an Associate Litigation Attorney in 2017. 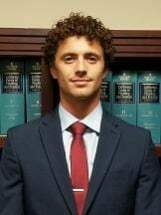 He graduated law school from the Dale E. Fowler School of Law at Chapman University in 2015 and prior to that obtained a BS in Neuroscience from Indiana University. While attending Chapman, Matthew focused on advocacy and dispute resolution, competed for Chapman's ADR team, and completed Chapman's Advocacy & Dispute Resolution Emphasis Program. Matthew was also able to gain experience as an attorney working in Chapman's Elder Law and Mediation Clinics. Upon graduation, Matthew spent two years working as a Contract Specialist in Apria Healthcare's Managed Care Department.